What’s Up With the Native American Subplot on Unbreakable Kimmy Schmidt? 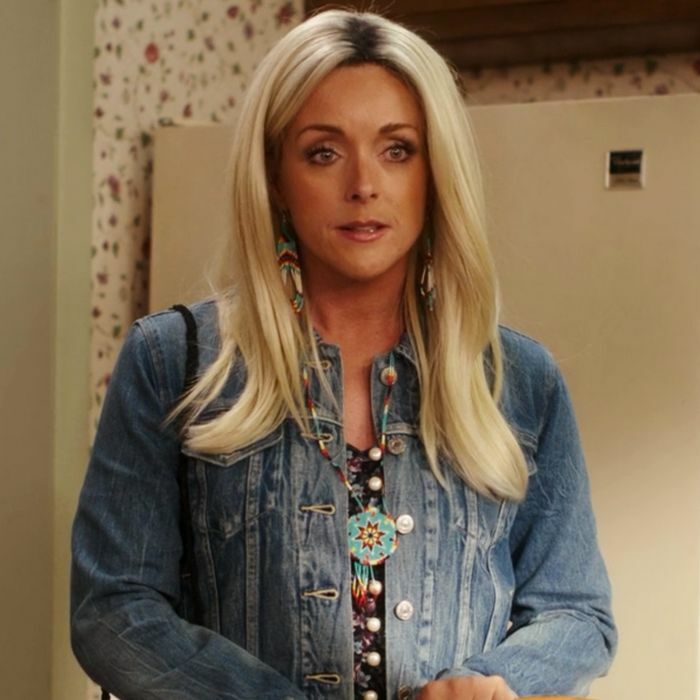 Jane Krakowski as Jackie Lynn, a Native American from South Dakota. Unbreakable Kimmy Schmidt, Netflix’s new series with a 30 Rock sensibility, is the show of the moment. It premiered to glowing reviews last Friday, with critics largely agreeing: It was “winning,” “very funny,” and “daftly effervescent.” But because the show is a delight to watch on so many levels, most reviews also swept one persistent plot point under the rug: Jacqueline Voorhees’s odd, irrelevant, and ultimately offensive Native American past. Here’s the problem: In the third episode, the audience learns that Kimmy’s boss, Voorhees, is secretly a Native American. This revelation would be one thing on its own, but Jacqueline is played by the very white, very blonde Jane Krakowski. The episode includes flashbacks to her adolescence, where Jacqueline (then called Jackie Lynn) is still played by Krakowski, with lip service played to her dyeing her hair blonde and getting blue contacts — but these are subtle details. When addressed, the subplot is passingly called “bizarre” and “inexplicable,” but most critics decide to leave all mention of it out — good or bad. At the panel for the show at this year’s Television Critics Association press tour, Kimmy Schmidt co-creator Robert Carlock explained the story line, but his argument reads like the rough equivalent of, Well, I have Native American friends: “We have a couple of writers on staff with Native American heritage […] So we felt like we had a little room to go in that direction.” He further explains: “Wouldn’t that be a crazy A-to-Z for her to deal with that, and maybe reconcile with it, and re-embrace who she really is, ultimately.” Basically, he’s explaining, they wanted to give her a sympathetic background. Carlock positions the decision as a narrative choice. But this specific backstory is most frustrating because it doesn’t serve a purpose, either narratively or comedically. There must be more compelling (and funnier!) ways to give Jacqueline a backstory that don’t require sloppily marginalizing a group of people who are already as marginalized as you can get. It’s especially disappointing because Unbreakable Kimmy Schmidt so deftly integrates race in other instances, mainly in the latter half of its first season. The most prominent example comes when Kimmy’s African-American roommate, Titus, gets a job that requires him to dress as a werewolf. The punch line: He discovers he gets better treatment from strangers while in a monster costume than he does as a black man. The point is sharp, and it works largely because Titus is the one pointing out the discrepancies. This is precisely what isn’t happening when it comes to the dynamic between Jackie Lynn and her parents. It’s clear the show intends for the joke to be on Jacqueline, but this approach fails roughly half the time. Jacqueline learns directions from the traditions of the Four Winds that help her in her future as a rich white lady who has broken her GPS in a tantrum; Jacqueline triumphantly howls at the sky after deciding to re-embrace her heritage and attacking a high-schooler in an Indian costume. The caricatures are so over-the-top, the show is clearly aiming for self-awareness (one of the latter episodes includes a line about being upset that Hispanics play Native Americans on TV — meanwhile, the actor who plays Jacqueline’s father Virgil, Gil Birmingham, is of Comanche descent). But self-awareness is often the pop-culture equivalent of prefacing a comment with, “I’m not racist, but …” — it doesn’t serve as instant absolution. Think of it this way: Is there any other race Krakowski could have played without raising a substantial uproar? The fact is, no matter what Krakowski looks like, we are asked to believe the character is Native American, a device that only serves to add color to the backstory of a character played by a very white actress. If we take the show at its word, we are laughing at a Native American woman who felt so uncomfortable in her skin and in not being a member of the dominant culture, she sold her soul to look the way she thought she should. That’s not funny; it’s disturbing. Not just because the pressure to Anglicize exists for so many cultures in America today, but because of how this very country systematically stripped the Native American people not only of their culture, but of their lands, too, not so very long ago. There is probably a way this story line could have worked, whether it would mean a different actress or a different tenor. Ultimately, Unbreakable Kimmy Schmidt is a comedy, and a very new comedy, at that. By necessity, much of the genre is about trial and error, attempting to push boundaries while also not overstepping. The fact is, most Americans don’t think about Native Americans because most Americans don’t have to think about Native Americans. They’ve been closed off from the vast majority of us, reduced to friendly stereotypes on television. What’s most disheartening about this isn’t that it exists, it’s that apparently, nobody thought it would raise alarms at all. What’s With the Native American Subplot on UKS?